If you’ve decided to visit Odessa, the renowned Jewel of the Black Sea, then you definitely need to think first about renting apartment in Odessa. It’s not always easy to quickly find yourself a temporary dwelling place in a city you know nothing about! This is why such question really should arise long before you grab your ticket and rush to the airport. Our company is happy to present you with several attractive options that can be a splendid alternative to an overtly expensive, not at all private Odessa hotel. With our help, you’ll rest assured that you are only going to get the very best. Your comfort during your trip is on top on our priority list! 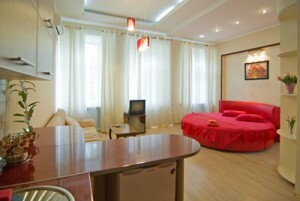 We offer you to rent an apartment in Odessa with us. Currently we’ve got several options available, all of them situated in the best districts of this magnificent city. We’ve set convenient, fully affordable prices that may vary a little depending on the season. For example, in May the apartment ‘Carmen’ cost $55 a day; and, as a rule, its daily charge wobbles between $50 and $70. This place is situated within a 5 minute walk from the very center of Odessa, with all the possible comforts within the apartment and plenty of attractions and shops just outside. We’ve got more alternatives in the same district, such as the exquisite ‘Sakura’, the sassy ‘Natalie’, and the elegant ‘Maria’. If you aren’t looking to stay in Deribasovskaya, Sobornaya Square or anywhere in the historical centre at all, we’ll gladly meet your interests. We’re putting all our efforts into providing you with flawless accommodation in Odessa. The apartments for rent in Odessa that we offer are designed specifically with our guests’ needs in mind. In summer you won’t have to suffer from the heat because the air-conditioning system will never fail you. How about a nice long soak in the Jacuzzi bath or a cozy dinner prepared personally by you in a fully fitted kitchen? Yes and yes! It’s all possible with our incredible Odessa apartments. We welcome single travelers, couples, and those who prefer spending the holidays as a group of friends. Have a lovely time in Odessa, enjoying high-speed Internet, Satellite TV, warm glowing fireplaces… and, of course, our city!